1 “Superheavy Samurai” Tuner + 2+ non-Tuner “Superheavy Samurai” monsters This card can attack while in face-up Defense Position. If it does, apply its DEF for damage calculation. Once per turn: You can discard up to 2 cards, then target that many cards your opponent controls; destroy them. Once per turn: You can banish all Spells and Traps from the GYs, and if you do, inflict 200 damage to your opponent for each card banished. Superheavy Samurai Steam Train King wraps up the week. Superheavy-centric materials needed for this this Level 12 monster, but the Superheavy archetype has plenty of high level monsters to use. The ability to attack in defense is incredibly handy when you’re throwing 4800DEF at your opponent. A 2-for-2 removal effect only makes this card better for the archetype. Clear the way for this monster to steamroll your opponent with 4800 damage. The banish effect of all spells and traps to do burn damage is a great way to empty out resources your opponent may be keeping in the grave, as Superheavy Samurai don’t run really any spell/trap. 200 damage per card can add up depending on the deck. As of right now several decks are packing 20+ spell/trap, and even just five would net you 1000LP damage. Cards that benefit from being in the grave like Trickstar Reincarnation you can get rid of before they are able to use them, or force them to trigger. This effect can cripple the Sky Striker archetype and remove their power cards from being recycled. Find the fastest way to get this train out and let it roll. Advanced-4.5/5- So much going for it as a boss monster for the archetype, as long as you can summon it. We end this week off with the boss of the Superheavy Samurai archetype that was released in last year’s Battles of Legend, Superheavy Samurai Stream Train King. 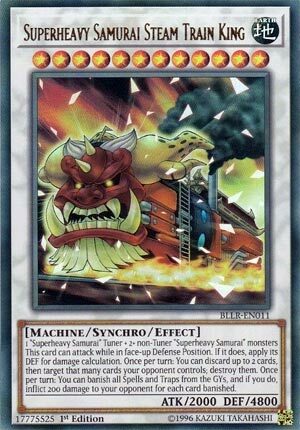 Steam Train King is a Level 12 EARTH Machine Synchro with 2000 ATK and 4800 DEF and requires 1 Superheavy Samurai Tuner and 2+ Superheavy Samurai non-Tuners. Superheavy Samurais are based on being in Defense Mode so the 2000 ATK is forgivable and 4800 DEF is amazing, the summoning requirements are likely what you would of been using to get this out since it is a Level 12, and the EARTH/Machine combination is good. This card can attack while in Defense Position and if it does, you apply the DEF stat for damage. Before Superheavy Samurais this was rare to see, but now it is all over the archetype and it gets around every Mirror Force except Dark Mirror Force, the one nobody plays. Doing damage with 4800 DEF while not taking damage if they somehow run this over is amazing. 4800 is a scary number in this game as the only number I know of that is higher is 5000, and those monsters are hard to summon. Once per turn, you can discard up to 2 cards to target the same number of cards your opponent controls and destroy them. You are already giving a lot into summoning this, but I guess it keeps this card somewhat balanced as Superheavy Samurais don’t struggle to summon this I believe, plus destruction for any card is great to have access to. Some Superheavy Samurais like being in the GY as well I believe. Once per turn, you can banish all Spells and Traps from the GYs to burn your opponent for 200 per Spell/Trap. Well this wasn’t doing enough damage already apparently, so it needed burn. Superheavy Samurais don’t really play Spells or Traps except for maybe Sekka’s Light. Steam Train King is a powerful boss monster in the archetype and is worth having a copy or maybe two in the Extra Deck depending on how tight it is. Art: 3.5/5 He looks pretty mad, that is probably why he has 4800 DEF. Anger gives you power. Speaking of names that are hard to say multiple times…or even just once, (takes breath) Superheavy Samurai Steam Train King closes our week. Now, look at this card, and see it has 4800 Defense points (Ohhh, Ahhh, Wow). I initially thought about making this week all about these cards, but the main point you need to know is this: these cards (primarily, especially as the Levels go up) have higher and higher defenses, and can attack in Defense position vis a vis Total Defense Shogun. I neglected to mention (pauses for dramatic effect) that their defense is applied for Damage calculation, making it seem a whole lot less crappy a Level 12 Synchro has 2000 attack (when it can attack with its 4800 defense) and the crowds gasps at that one more time…but S3 Train King has more tricks in it’s arsenal. You can also discard up to two cards from your Hand, to destroy that many cards your opponent controls. Balanced destruction is good, giving up something from your Hand to destroy something on your opponent’s Field is great, and if you’re giving up something you WANT in the Graveyard without having to wait for it to be destroyed, you can easily + and gain advantage of this effect quickly. But wait, folks, that’s not all, there is another effect, and it does Burn, albeit odd for these cards. Oh, and just for fun, remember, try attacking with this guy, and throwing in a D2 Shield…that’s a 9600 attack right there…still while in Defense position. It’s a shame, but appropriate, this card can’t be used outside its theme. It’s amazing, I absolutely love it. Rating: 5/5 Wonderful boss Monster, difficult enough to bring out, but so worth it, and this theme is fast, and can certainly protect it. Powerful, gargantuan defense (or attack, however we look at that) and a destruction, as well as a burn effect…it does so much. Art: 5/5 It’s the pissed off train car from hell…all that Fire in the picture makes me feel he should be Fire, instead of Earth, but staying Earth fits the theme better.